After suffering through an 8-week coma, several strokes and the amputation of the lower half of both legs as a result of Wegener’s Granulomatosis Disease, 39-year-old Marc Milkie could have given up. 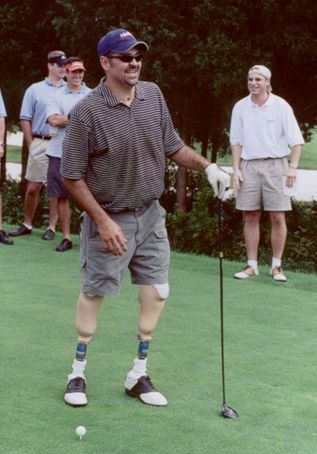 Yet, with the same spirit and vigor he always shared in volunteering in his community, Marc successfully rehabbed for months and drove the first ball in our 2003 Golf Outing in D.C. In 2002, more than 120 guests at the D.C. golf outing helped to raise funds to enable Marc to take a special drivers training course and equip his car with the necessary tools for him to drive. According to Marc, Betterment’s support helped him return to work and allowed him the freedom to volunteer for coaching positions, visit people in the hospital who were going through similar rehabilitation and share inspirational talks at student retreats. Beyond these great community endeavors, Marc joined the Betterment board in 2004 and has been instrumental as the head committee member for all Betterment events in Cleveland. Even his children have been inspired by their dad’s involvement. His oldest daughter, Devon, can often be seen setting up and cleaning up for events, or selling raffle tickets.